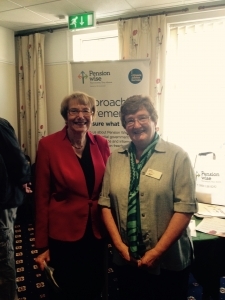 PensionWise attend the Over 50’s event in Broadstone, Poole. 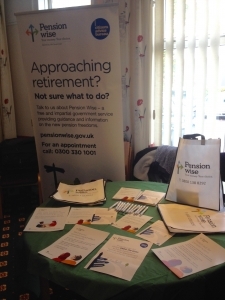 Home/news/PensionWise attend the Over 50’s event in Broadstone, Poole. Pension Wise attended the very successful Broadstone, Poole 50+ Forum event on Tuesday 25/10 at the Royal British Legion Hall. It was open to the public and had stands relating to the over 50’s with many local and national organisations represented. We met the Poole Town Crier, David M Squire and Dame Annette Brook who opened the event. Isabel Dodds and Jane Clark attended for Pension Wise and found there was a lot of interest in Pension Wise and the service we provide. We are hoping this event will generate appointments for us and that it helps to continue to highlight the free and impartial pension guidance we offer to the over 50’s. 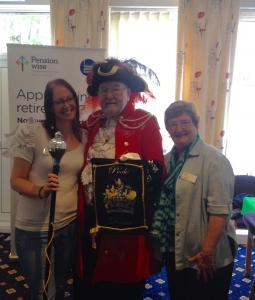 Jane Clark and Isabel Dodds with with David M Squire, the Poole Town Crier – he has been the Town Crier for 58 1/2 years!